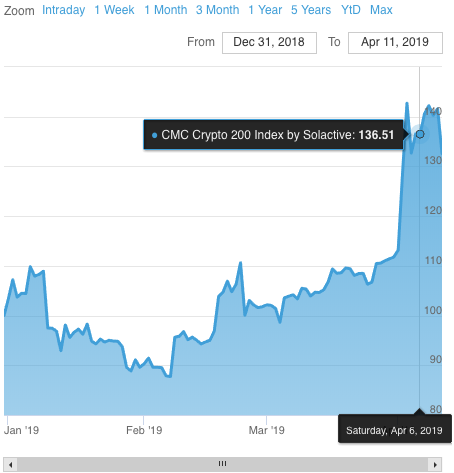 The CoinMarketCap Indices are a suite of benchmark indices designed to be the most comprehensive in the market, measuring the performance of the top 200 cryptocurrencies by market capitalization traded in USD. 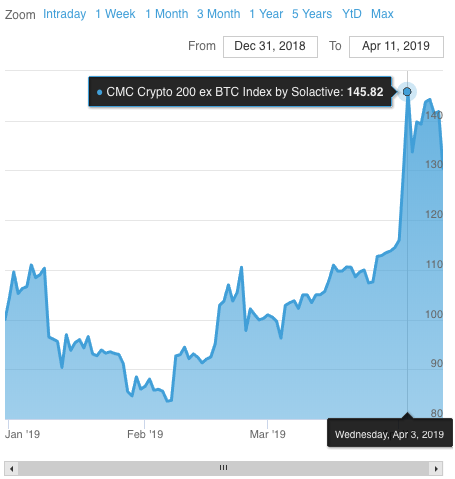 Being the crypto data standard that pioneered the market capitalization valuation model in the crypto asset space, CoinMarketCap’s data will power these indices for the most accurate headline references that will extend to pricing and investable indices in the near future. These indices are developed and owned by CoinMarketCap, the world’s crypto data authority, and calculated and administered by Solactive, an index engineering firm in Germany that is fully compliant with IOSCO Principles for Financial Benchmarks. If you’re interested in creating your own custom index, please contact us. While you can look at the data for each cryptocurrency on its own, having a large collection of numbers is bulky and inefficient to use for tracking general performance. Hence, there is a need for a single value to easily compare and track changes of a set of cryptocurrencies selected for specific characteristics, such as market capitalization or industry. An index is a construct meant to monitor the changes in the prices of its constituents over time. These are rules-based indices calculated and administered to exacting standards with a start date of December 31, 2018 and a base value of 100.00. The index is rebalanced on the last day of each calendar quarter. Index constituent weights are fixed on the selection date, which is five days prior to the rebalancing date. At this time, all eligible cryptocurrencies are ranked by their current market capitalization. This ensures growing or shrinking cryptocurrencies are accurately represented in the overall index. At any time, if a cryptocurrency is no longer eligible for membership, a replacement is named at the next scheduled rebalancing. The volume-weighted average price (VWAP) for each cryptocurrency incorporates pricing data from over 200 licensed exchanges, weighted by trading volume. The index is calculated and administered by Solactive AG, an independent index provider based in Germany. Solactive develops, calculates and markets indices in multiple asset classes and complies with IOSCO Principles for Financial Benchmarks. The index is owned by CoinMarketCap, an independent, unbiased provider of cryptocurrency pricing with history on over 3,000 cryptocurrencies dating back to 2013. CoinMarketCap is the most trafficked site in the world for cryptocurrency information, with over 125 million people in 2018 relying on CoinMarketCap as the most trusted reference price for cryptocurrencies. CoinMarketCap calculates market capitalization for each cryptocurrency as “price multiplied by circulating supply.” The circulating supply metric used by CoinMarketCap accounts for locked, reserved or non-saleable coins or tokens that cannot affect the price of a cryptocurrency, and hence are not factored into a cryptocurrency’s market capitalization. Using circulating supply to determine market capitalization for cryptocurrencies is analogous to using public float to determine market capitalization of publicly listed companies. Thank you for checking out our indices; please fill out the form below and we'll get in touch with you as soon as possible!